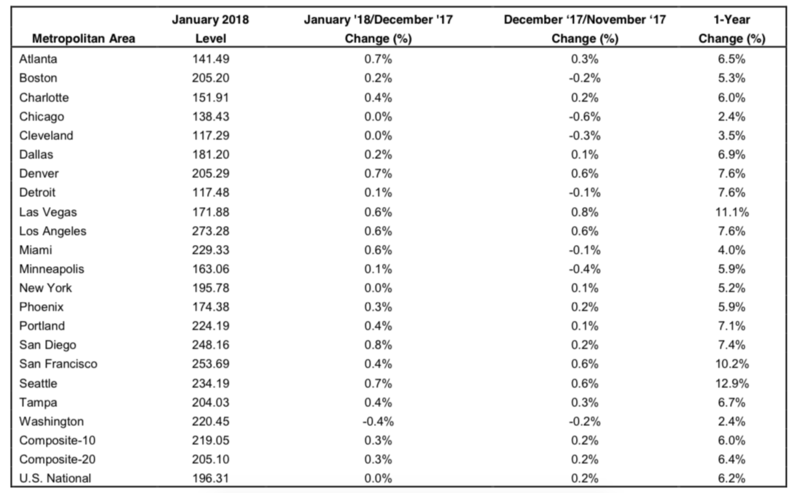 January’s S&P CoreLogic Case-Shiller U.S. National Home Price NSA Index shows that home price growth is unlikely to slow down anytime soon — January 2018’s national index comes in at 196.31, a 6.2 percent year-over-year and a seasonally adjusted 0.5 percent month-over-month increase. S&P Dow Jones Indices managing director and chairman of the index committee David M. Blitzer says the increase in home prices is due to two factors — low inventory and a low vacancy rate among owner-occupied housing. He also noted there are no “weak spots” when it comes to individual markets, and the home price index continues to outpace the national GDP. The 10-City and 20-City composite boasted 0.3 percent year-over-year gains, and the cities of Seattle, Washington; Las Vegas, Nevada; and San Francisco, California; led the way. Seattle reported a 12.9 percent year-over-year price increase, followed by Las Vegas with an 11.1 percent increase. San Francisco shored up the end of the pack with a 10.2 percent increase. The 10-City and 20-City composites reported 0.7 and 0.8 seasonally adjusted month-over-month increases, respectively, and no city reported a negative monthly price change. 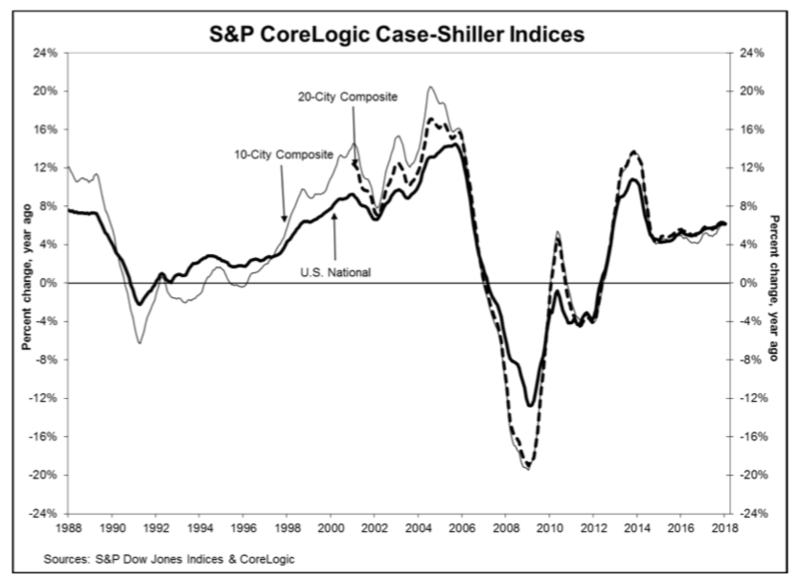 The S&P CoreLogic Case-Shiller U.S. National Home Price Index is a composite of single-family home price indices that is calculated every month; the indices for the nine U.S. Census divisions are calculated using estimates of the aggregate value of single-family housing stock for the time period in question. CoreLogic serves as the calculation agent for the S&P CoreLogic Case-Shiller U.S. National Home Price Index.